"We don't tend to rehearse 'cuz it's like rehearsing what you're gonna say to someone in a conversation... It always comes out different anyway, so we just go at it and see." So you want to be a DJ? Think you're an awesome mixer and that you've got the creative energy to go into a dark, smoky club and get the whole place into a music-induced trance? Great. The problem is: you have absolutely no clue where to start. 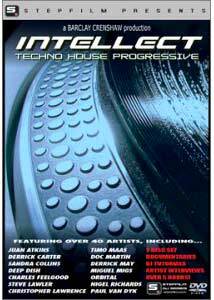 Well, wonder no more because Intellect is here, and it's one of the most impressive, professionally produced introductions to DJing in the electronic dance music scene one could possibly hope for. Want some pointers and advice from professionals and people who are considered legends around the world? You've got it. Want a complete tutorial on how to get started with your first turntable and mixer? You've got that too. Everything the beginner needs to know to get into full-on live jamming and mixing is presented here in this truly entertaining and impressive two-disc set. A DVD like this has hit the streets none-too-soon, as we now live in the age of the "celebrity DJ" and the massive onset of the global techno scene. Whether you like straight-out techno, house, jungle, gabber, trance, acid, or whatever, there's a whole new standard. The bar has been considerably raised for what it's like to DJ, thanks to the focused efforts of so many around the world; now it's gone beyond just coming up with a playlist and passionlessly cueing up records. People expect, at the very least, someone with an intimate relationship with the music their presenting and playing. You have to be "one with the music," as corny as that might sound, and really put on a show; and it doesn't matter what kind of music you want to play, either. With the advancements made in home computer technology in terms of mixing, recording, and burning, there's a whole generation of people turned on to the fine art of compilation mixing, but perhaps not really understanding how they make a career out of it or develop it into something far beyond what they currently do. Intellect aims, not only to initiate the amateur into the real world of DJing and its culture, but to also arm him/her with powerful knowledge that will get them well on their way to personal success. Disc One of this set contains a short documentary of numerous interview segments with many of the established names in the DJing and live electronic performance scene, and it's an impressive roster. From current faces like Sander Kleinberg, Deep Dish, and Swayzak, to some of the pioneers of the core techno scene like Juan Atkins and Derrick May, you get some solid tips, insights, and overall musings from people who have been there and done it. Additionally, there's Paul Van Dyk, Timo Maas, Deep Dish, Ming and FS, DJ Collette, Doc Martin, The Detroit Grand Pubahs, and more. There's even some thoughts from the masterful (and my personal favorite) electronic music duo, Orbital (Paul and Phil Hartnoll), who have become quite noteworthy for their onstage performances to which they literally bring their entire studio. Although the interviews are brief, when all of them are taken together, they form a mountain of general wisdom from people who have had quite a bit of experience not only DJing, but also producing and making music, and marketing it. The second disc contains a fairly long and detailed beginner's tutorial on the basics of DJing and getting into live mixing. The tutorial is designed from the standpoint that you hopefully own one of the legendary Technics SL 1200, widely considered to be the best turntable ever made. Of course, for proper DJing, you'll need two tables and a basic mixer that can, admittedly, run you somewhere in the neighborhood of $3000-4000 (cheaper alternatives are actually starting to emerge, though, including a new generation of CD-based turntables, believe it or not). Regardless of the technical specifics, once you've got your equipment (at the minimum, the tutorial recommends a magnetic-driven drive; there's simply no way to mix with belt-driven record players), DJ Nigel Richards will teach you how to set up your equipment, as well as some of the ins and outs of all the switches, knobs, weights, and possible needles you'll want. From that point on, he gives basic lessons on how to put records together into a mix and how to use the core controls (namely the table speed and pitch control) to achieve seamless mixes. Practice makes perfect, as he says. There's more stuff there, but in general, it's a well made crash course in the dynamics of turntable mixing and it properly discourages certain behaviors and attitudes that might have negative effects on your performance. In addition to the lengthy (hour-plus) material designed to get you going, there are interviews with DJ personalities regarding things like getting performance gigs, associating with a booking agent, creating and composing your own music (instead of solely making your career on other people's stuff), and advice on playing live. The guys from Orbital also give their opinions on live performances, which is valuable given their fame as a fantastic live act, despite being a totally electronic band that basically just tweak knobs and buttons for a few hours. It is wisely pointed out that the composition and production of electronic music nowadays is considerably easy given the proliferation of excellent home-level software for hard-disk editing, track recording, sequencing, etc. The need for expensive external production equipment is no longer really a requirement, at least for getting started. This stuff can also be used to manufacture your own set mixes for burning onto CDs to self-publish and get yourself out there. As you can see, Intellect is quite thorough. While it could have gone further, it's impossible to be totally thorough on a subject like this. For a "get started" approach, though, it's undeniable that in the largely hype-inflated world of professional, scene-based DJing, this program delivers an honest experience. It isn't some flashy, badly produced documentary that will send hundreds of people off to the music store with delusions of grandeur; it's legitimate, practical knowledge that will inspire people to go out and make their own music, with at least the fundamental knowledge about the world they're entering. Image Transfer Review: The video quality is constant throughout the program. As the entire thing was pretty much filmed with basic, home-video cameras, the look is constant, clean and sharp. Obviously, there's no fancy cinematography, but there's also no digital flaws either. I detected no serious issues and certainly no artifacting or pixelization. Extras Review: While there are no "extras" per se, people buying this disc will get the useful and extremely well made DJ tutorial on the second disc. In reality, it's part of the whole experience, as Intellect wasn't made to be just a documentary, although the first disc is entertaining. I suppose there could have been some extras put in like, for example, DVD-ROM material such as samples, loops, soft-synths, and other files to get an amateur musician started, but on the same token I don't fault Stepfilm for not including that stuff as it is so easy to find on the internet and you're likely to be pointed in that direction anyway, once you actually get some of the software and/or equipment involved. The presentation is minimal but very effective. The divisions of chapters, especially in the tutorial, makes navigation very easy. If you want to get off the sidelines and actually get into the mixing scene, Intellect is a must. Even if you don't plan to do live DJing with turntables and all that, it's still a great experience for any fan of electronic music, even if you're souring a bit on the whole "celebrity DJ" thing. If you're only interested in sitting at your computer and mixing tracks, there's still practical ideas and tips here for the casual artist.